The idea is simple, attract more pelagic fish close to Pom pom Island using fish aggregation devices. The design and science behind FAD's is on the main website. 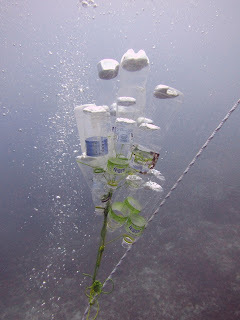 Our FAD's use recycled plastic water bottles rescued from the high tide line of the island. Lots of plastic bottles litter the worlds oceans and many eventually drift onto beaches. Many volunteers including the British Council Teachers have helped, A short walk around the island helps clean the beaches for the turtles and gives us a large supply of bottles. They were trash and we give them a use and a purpose. To see how we made the bottles lines - click here. Untangling the rope for the FAD. With some short pieces of string tied to the bottle neck and organised into groups of 6 or 8 the bottles are the centre core of the FAD. A recycled 20 litre drum from a construction job provides the major lift required. 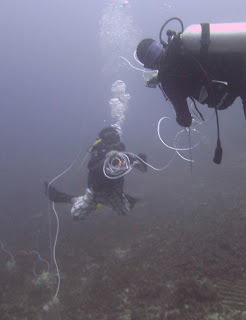 The first step was the most experienced divers in our volunteer group went to 40 metres to search for suitable sized rocks to tie the FAD lines too. The FAD lines are white rope in the pictures. With air in the yellow drums, the line is as tight as a guitar string. 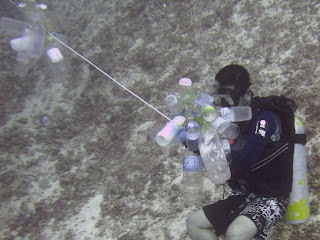 Our job underwater is to attach the plastic water bottles at 3 m intervals. We have discovered that a group of more than 8 bottles in each hand is a mistake! They twist and wrap and before you know it you have a ball of bottles, each wrapped around the other. The next challenge is to find the FAD lines, should be simple, swim along the reef at about 15m deep and 25-30m offshore so you can see the bottom and just see the reef slope. (The water clarity here is excellent normally 30m but sometimes as bad as 20m visibility.) The FAD lines will be vertical white rope with a big yellow buoy at the top. There are four of these at the moment and on our first dive - WE MISSED THEM COMPLETELY. We all know you don't get Narcosis at 15-20m and none of us are that blind so perhaps they were tied badly and drifted away. Discussions about bad knots and blind people led to the next dive trip. and twist in lots of different ways. The first set of bottles with air. The next dive trip would have another disaster if it wasn't for the sharp eyes of Sylvia. The barrel was spotted below us with the line almost horizontal. 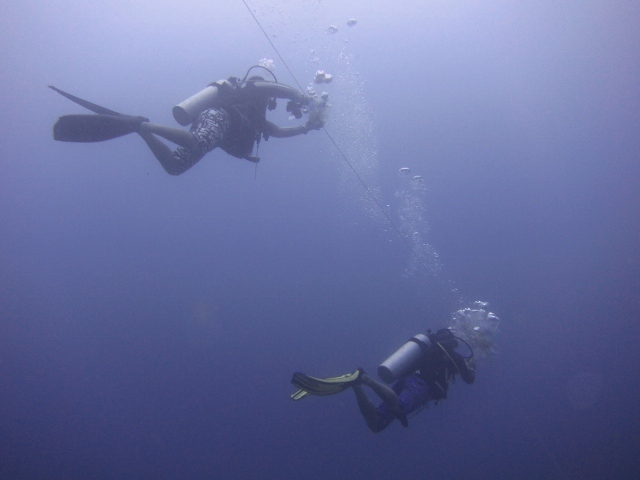 On the previous dive we simply swam over the top of the FAD and didn't see it. Filling the bottles with air turned out to be tricky, hold on with one hand so the current doesn't wash you away. Hold the bottle with the other hand, manoeuvre the funnel under the bottle mouth with a third hand and then use the spare regulator, or Octopus with a fourth hand. Since we don't have four hands this was a tricky exercise and our photographer was clearly laughing at our struggles. Eventually, we managed to fill many of the bottles with air, the rest will wait for another dive. Divers filling the bottles with Air.